Prompt: Kaus is an established insurance company that is looking to change from their B2B format to an E-commerce site for individuals to purchase insurance packages. They offer a variety of insurance options (property, motor, liability, marine, aviation, life, etc. ), and are looking to sell prepared packages directly to individuals/families. Specifically they want to tap into the younger demographic that looks to buy insurance online. In addition, they want to upgrade their branding to reflect their new approach. Design a responsive insurance website geared towards a young demographic. 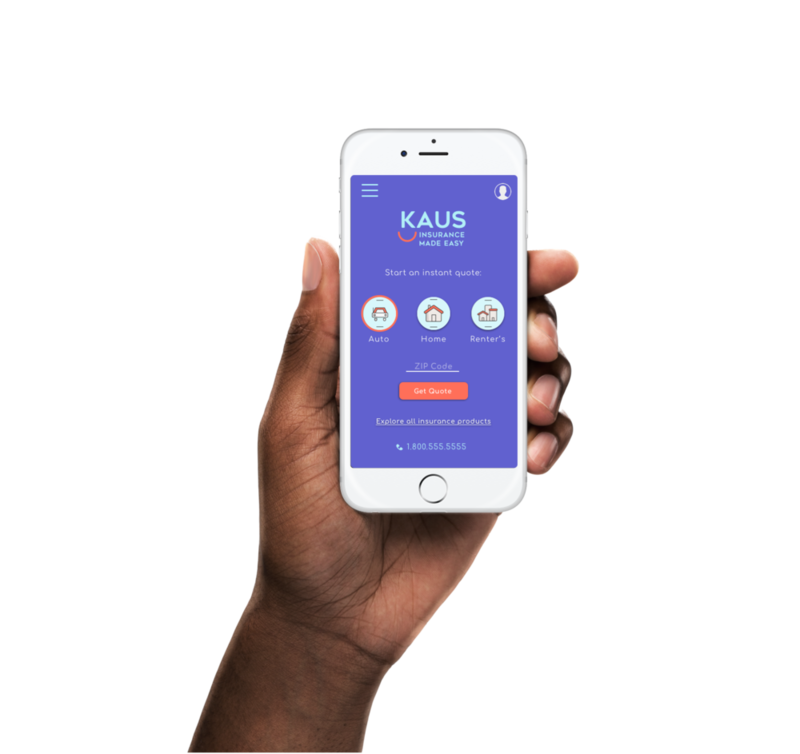 A fresh makeover to the Kaus brand and user experience that helps users efficiently buy insurance on any device. My research for Kaus began with three methodologies: secondary research, competitive analysis, and 1:1 interviews. This allowed me to gather quantitative and qualitative data, which would give me a well-rounded understanding of how and why people go about purchasing insurance. I started by obtaining a quote from each of the competitors. I found that the direct competitors all offer a similar experience: getting a quote, exploring package options, and purchasing the desired option. Most of the quotes require a 5-step process, and all offer almost the exact same variety of options. Every competitor offers a bundle of home and car insurance, but none of them offer packages beyond that. From this research, I gathered that the majority of customer satisfaction comes from affordable prices and great customer service. Customers are also responding positively to sites that have easy-to-use mobile apps. After feeling grounded with some knowledge of the standards of the insurance industry, I drafted a guide for my 1:1 interviews. I talked with eight individuals, 7/8 were between the ages of 24-35, which I had defined as my core demographic. I organized and visualized my research findings into an empathy map so that I could define some considerations, pain-points, and needs that the customer encountered during the insurance buying process. -A simple, quick, expedited process when buying, managing, and communicating about insurance. -Great customer service and human interaction. -Assistance understanding insurance pricing and coverage options. My findings led me to Liz Watson- who just purchased her first car and is looking to buy insurance that she understands and trusts. Outlining the business and user goals allowed me to identify not only what to design, but how to design it. The features as well as the branding should reflect these shared goals. In order to understand how customers intuitively organize information, I conducted an open card sort through Optimal Workshop. Users were given 30 types of insurance and prompted to organize them into groups, and assign a name to each group. I opted for the open sort so that I could have insight into how people label the groups that they make. As results came in, patterns quickly emerged. There were three main groups that everyone agreed upon (Home, Auto, Business), and a group of outliers that would need to be further tested. 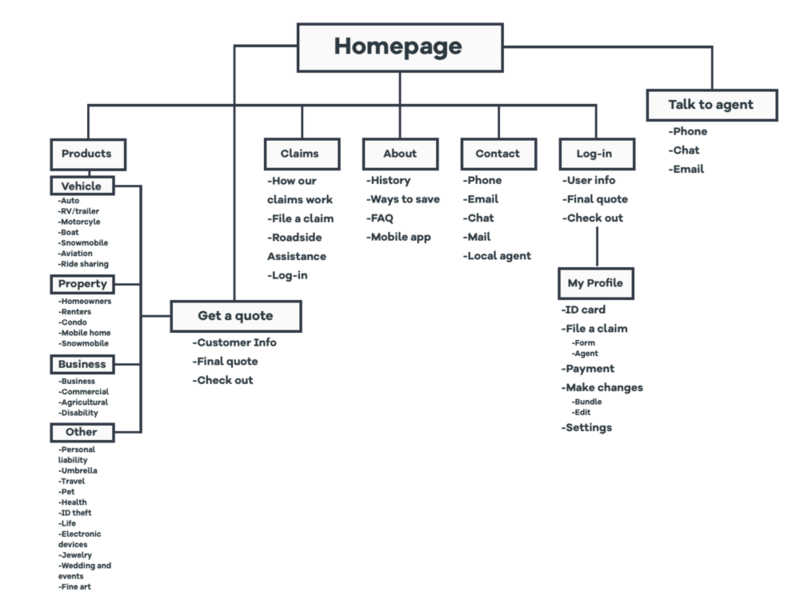 Using the information I gathered from the card sort, I created a site map and user flow. I also relied on previously established design patterns, referenced from secondary research. It was time to start putting pen to paper and sketch out rough ideas of how the landing page could look. From there I moved on to the other key screens Liz would encounter during the user flow. I later uploaded them to Marvel to get a better feel for how they would operate in real-time. 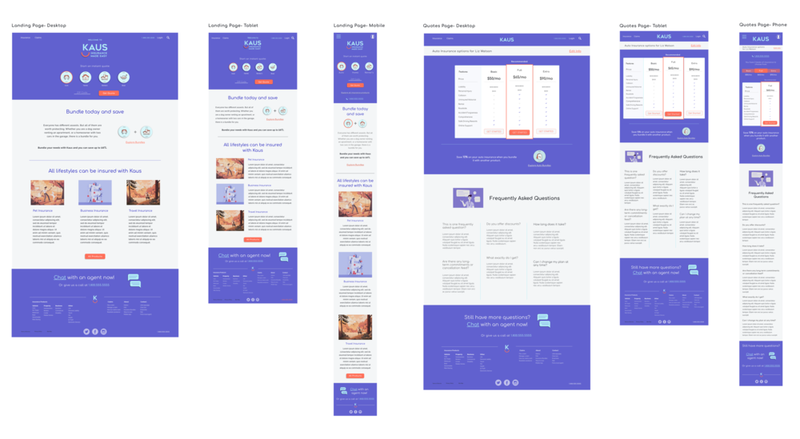 I wanted a simple and clean visual design that would make the insurance purchase process quick and easy, without looking sterile and mundane. I also wanted Kaus to stand out from competitors by looking contemporary and fun. I designed with three brand attributes in mind: simple, friendly, and reliable. I met with five people and tested my prototype using InVision. After they completed the given tasks I received feedback on the experience. 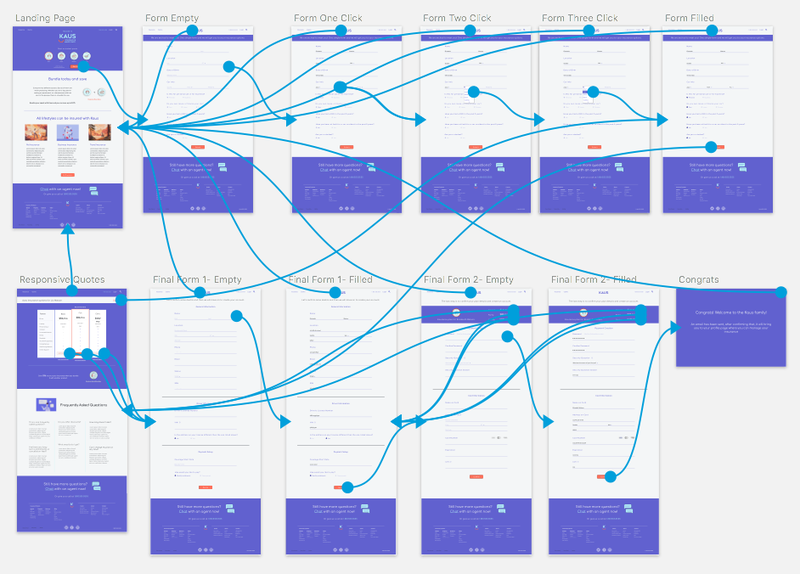 I synthesized my findings from the test and determined where I needed to make adjustments to the wireframes. The overall flow was successful, but testers were left feeling uneasy with the confirmation page so I needed to make that page more reassuring and direct the user to the next step of the experience. Other minor alignment alterations needed to be made to the pricing page. Insurance isn’t the most exciting industry on paper, so this capstone provided the challenge of creating an experience that was simple and approachable. What I learned most was that “simple and approachable” needed to be grounded in research and shown through the interaction and visual design. Users need to know their time and experience is being considered, therefore creating clean and straightforward forms was key to this project. Some next steps would include building out the bundle option pages, which could set Kaus apart from competitors and further and improve the user experience.